I have 3 vertices (V1, V2, V3) randomly selected on a regular triangle mesh. 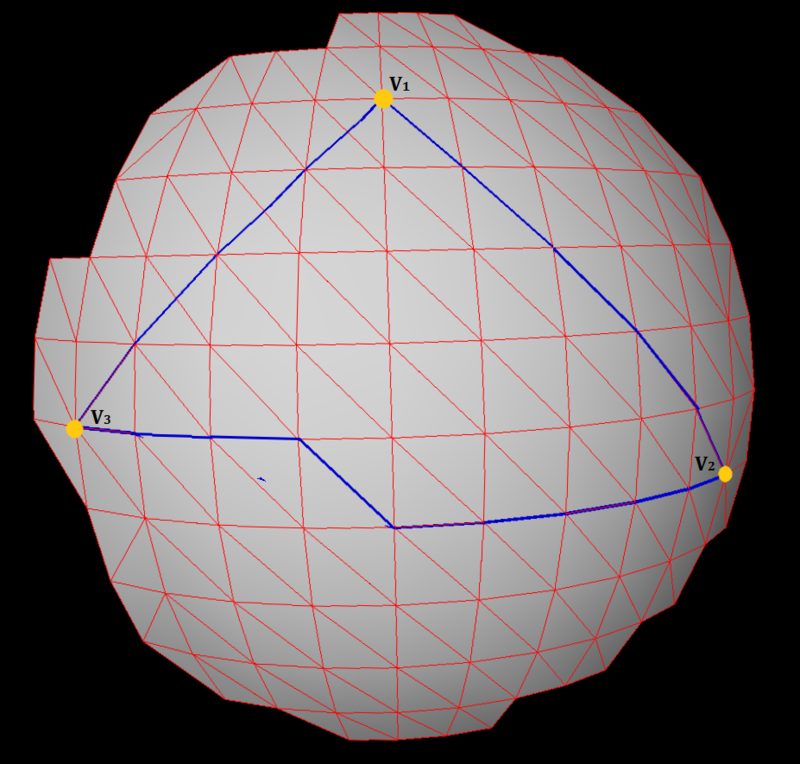 For these 3 vertices, I have computed the geodesic distance and the path (by using Dijkstra) among them and formed a triangle-like surface as in the above figure. Now, I have the vertices that lie in each path and can compute geodesic distances from a given vertex. What I want to do is to get the vertices or triangles that lies in triangle-like area. How can I do this? There is an alternative method that relies on flood filling. First arrange your edge data into a loop where the edges are forming a counterclockwise loop. Then start at an arbitrary point on the loop and pick edges joining that point. Use the outbound boundary edge and cross it with the other outbound edge, if it points in the direction of the face normal then it's an edge to be included, if not discard it. From this edge continue until you hit a boundary edge, at which point you terminate the fill. Continue at a yet to be visited boundary edge vertex. For your example with 3 points: Find the intersection vertex from the segment v1,v2 and the line that v3 lies on. (The vertex to the upper left of v2) We'll call this vertex v4. It's called scanline because (in the image above) you go down the red and green lines simultaneously and then red and blue lines simultaneously scanning the lines in as you go. This solution would be very fast if there is an index pattern, which is often the case. Otherwise a calculation would be needed to determine which neighboring vertex lies on the line. Funny thing is scanline, barycentric testing (in triangle bounding box), and flood fill are all ways of drawing triangles in 3d rendering. I think you can calculate some surface-bound barycentric coordinates for each point on the surface, and then use them to check for inside or outside of the triangle. I don't have an exact algorithm at hand but I found this following paper which does seem to handle exactly this kind of coordinates. Not the answer you're looking for? Browse other questions tagged mesh triangulation or ask your own question. How can I concentrate points in areas of higher curvature?